The Fraternal Order of Police is the nation's largest law enforcement organization, with over 293,000 members and over 2,000 lodges throughout the United States. 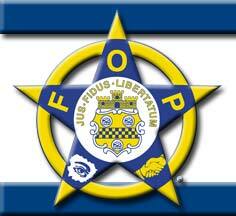 Founded in 1915, the F.O.P. represents professional, full-time officers from all agencies of law enforcement. Active membership in the F.O.P. is open to all full-time law enforcement officers, regardless of rank, and retired officers as well. Municipal, county, state and federal government officers are eligible for membership. The F.O.P. is law enforcement officers striving to improve their profession by improving working conditions by monitoring legislation affecting law enforcement on the local, state and national levels. The circle binds the seal of Fort Pitt to remind us of where the Order originated. The Latin motto translates to: "Law is the safeguard of freedom".